T+A makes five new additions at CES 2014 | What Hi-Fi? T+A has unveiled five new products at CES 2014 – three of which are new additions to the German company's range of high-end, high-voltage audiophile hi-fi separates. The three new HV products consist of the P 3000 HV pre-amplifier, the A 3000 HV stereo/mono power amplifier and the PS 3000 HV, a stand-alone power supply for the A 3000 HV. Starting with the P 3000 HV, the new pre-amplifier comes with seven unbalanced and four balanced inputs. T+A has used identical 'double-mono' circuit construction, as well as housing each section within its own compartment for increased internal shielding. The unit comes with a "totally linear and interference-free" power supply with "totally separate analogue and digital supplies." These also come with their own power input. A high-end headphone amplifier is also built into the device. The A 3000 HV stereo/mono power amplifier delivers 500W output per channel. It also features single-ended or balanced input, 10mm thick internal shielding between the power supply and amplification circuitry. Identical 'double-mono' circuit construction has once again been implemented. The A 3000 HV also plays host to a 1000W torrodial transformer, which is sealed in an aluminium enclosure. The PS 3000 HV power supply aims to increase output power and current capability. It connects to the A 3000 HV via T+A's 'Power-Link' and in doing so, supplies the power output stages. The internal power supply of the power amplifier meanwhile drives the sensitive input stages and high-voltage amplifier. The use of the optional power supply isolates the A 3000 HV from the load currents and mains-incduced interference. The whole range will go on sale in the UK in Q1 2014. The P 3000 HV will retail for £9500, the A 3000 HV £11,900 and the PS 3000 HV power supply £7900. T+A also made an update to its TCD 610 W subwoofer with the new TCD 610 W SE. The new subwoofer features two new 26cm drive units which benefit from specially designed aluminium baskets with narrow struts to reduce turbulence. A new 1000 Watt power amplifier is included and thanks to digital processing and a microphone, the TCD 610 W SE can be automatically calibrated to any room. Also due for release in Q1 2014, the T+A TCD 610 W SE subwoofer will retail for £3770. Completing the line-up is the new CARUSO Blu all-in-one stereo system. The new device can support Blu-ray, CD, DVD, Internet radio, network music servers, USB storage media, Bluetooth music transfer, DAB+ and VHF radio - so quite a lot. 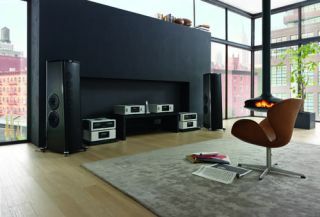 The CARUSO Blu has internal speakers, so can therefore be used as a standalone unit. Alternatively, thanks to pre-amplifier output, it can be connected to an external pair of speakers. The T+A CARUSO Blu will retail for £2990 when it is released in Q1 2014.